Conquer Divide, an all-female metal rock band, is conquering rock radio stations across America. It’s only been a year since their first self-titled album was released and they have already landed number 13 on Billboard’s HeatSeeker charts and number 33 on Billboard’s Mainstream Rock/Radio Charts. 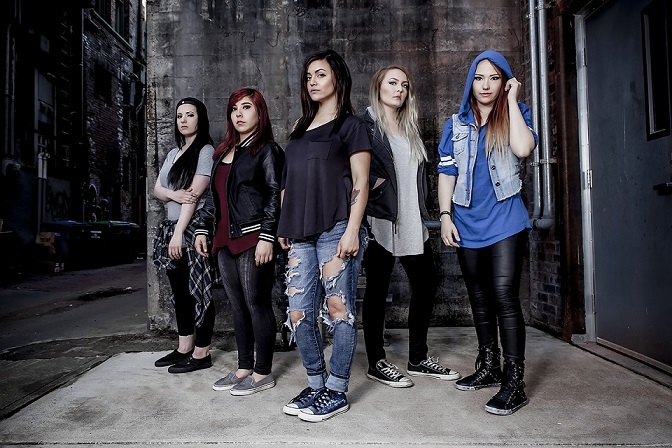 The band consists of screamer and vocalist Janel Duarte, guitarist Kristen Waters, drummer Tamara Tadic, lead vocalist Kiarely Castillo, bassist Ashley Colby and guitarist Izzy Johnson. For Duarte, hearing her band’s name on the radio is surreal. “We’re getting up there and it’s a lot to do with our fans,” she said. “They are calling the radio stations requesting us. It’s such a lovely feeling.” Conquer Divide’s music is a mixture of metal rock and softer rock tunes. Duarte said the bands “Beartooth” and “Attack Attack!” were some of the band’s major musical influences. What she loves most about being in the band is when they all get to [jam] together and go to different cities that they’ve never been to. “It’s always a good time when we are out travelling and then the shows are just the highlight of the night,” Duarte said. She added that touring isn’t dreadful: “When we got stuck by the side of the road at the end of our ‘Slave’ tour, we were all giggling. We were in the middle of the desert.” The girls are very close-knit and they conquer all their band issues together. “We’re a really strong band,” she said. Duarte said that the whole experience is worth the sleepless and showerless nights. Conquer Divide wants listeners to feel comforted through their music. They write their songs based on experiences that everyone goes through. “Everyone goes through a lot of stuff in life, so I have a few things that I want to get off my chest and that’s where my inspiration comes from,” said Duarte. Janel Duarte, vocalist/screamer performing live. Photo by Lauren Klinge. The girls are currently saving up for a new van for future tours. As soon as they hit the road again they are looking forward to touring and performing in Canada.